Billy Bob Thornton is primarily known as an actor nowadays, but it would be foolish to forget about his contributions to the film world as a writer/director - after all, the guy is an Oscar winner. In 1996 Thornton earned nearly unanimous critical praise for his directorial debut, the Southern drama Sling Blade, for which he picked up both an Academy Award for Best Adapted Screenplay and a nomination for Best Actor. His filmmaker efforts since, however, have been rather few and far between, and he hasn't directed a feature since 2001's Daddy and Them. Now he's finally back in the director's chair, and from the look of the trailer for his new movie, Jayne Mansfield's Car (which was posted by Yahoo!, there are equal parts drama and comedy to be had. Based on an original screenplay by Thornton and Tom Epperson (with whom he also wrote Sam Raimi's The Gift), the film is set in 1969 down in Alabama and finds two families, one from the south and one from England, who are forced to reunite after the death of a beloved, long-estranged wife and mother. Personal issues as well as cultural differences keep the two clans at an arm's length, but soon truths begin to be exposed and they they begin to grow closer together. As you can see in the trailer, the movie has an absolutely stunning ensemble cast that includes Thornton, Robert Duvall, John Hurt, Kevin Bacon, Robert Patrick, Ray Stevenson, Frances O'Connor, Ron White, and Katherine LaNasa. You may remember us talking about the film earlier this week when we got the chance to debut the first theatrical poster, which is filled with southern charm and recognizable faces. Check it out again below and click to see it in its highest resolution. This project has been in the works for ages - we first heard about Duvall, Bacon and Hurt joining the cast in June 2011 - and it actually had its premiere all the way back in February 2012 at the Berlin International Film Festival. Typically it's not a great sign if a movie with an amazing cast and a known director can't find a release date after a festival run, but given all of the names involved with this project it's hard not to give it at least the benefit of the doubt. The film will now be getting a release on two platforms. 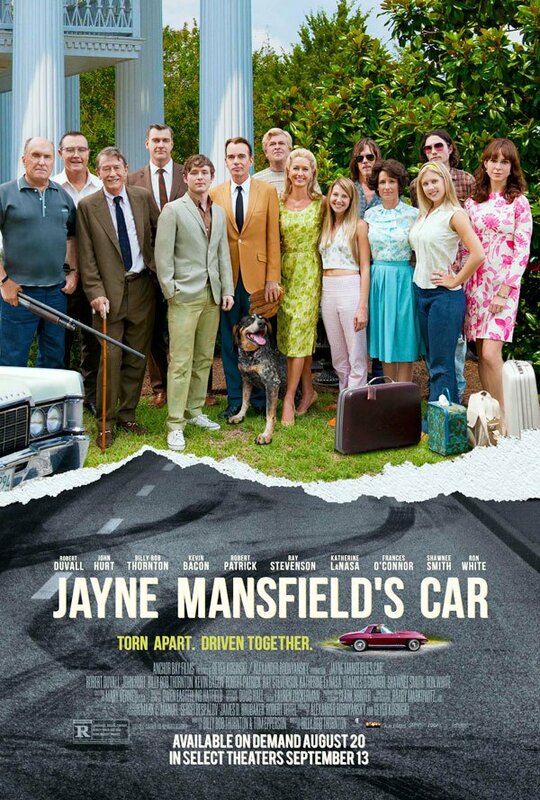 You can look for Jayne Mansfield's Car when it hits VOD on August 20th, and then, as you see on the poster, you'll be able to hunt for it in select cities starting on September 13th.